So far, we've raised a total of $2906. Specifically, $1455 for Global Fund for Women and $1451 for GirlVentures. A huge thank you to all who have donated! Your tax-deductible contributions will help empower females around the world! We hope to raise $5000 for each organization by the end of our Camino (late April)...and we'd REALLY like to have at least half (if not all!) of that taken care of before we leave for Spain in early March. To those who haven't yet donated -- please help us reach our fundraising goal by giving whatever you can to GirlVentures and/or Global Fund for Women. NH and MA folks -- visit the Portsmouth Brewery on Tuesdays, buy a "Community Pint," and choose Girls on the Way as your charity of choice. In April, that "community pint" money will be sent to Global Fund for Women in honor of Girls on the Way. I've decided on my footwear. For snow and cold -- my North Face winter hiking boots. They're old as the hills, but they're trustworthy and comfortable. I wore them on our last two training hikes (see below) and my feet stayed warm and dry. For warm weather -- the Hedgehog GTX XCR III. I've no experience with these shoes, but they were on sale at a local store and they came highly recommended. I'll break them in before we leave. For albergues and town-walking -- my ancient Crocs. Last week, I wrote that we were going to stick to long road walks for a while. Of course, right after I posted, the girls decided they wanted to do a couple of 4Ks. We therefore ascended Tecumseh on Thursday and Moosilauke on Saturday. Mt. Tecumseh Trail. 2250 ft elevation gain, 5 miles roundtrip. Tecumseh holds a special place in our hearts; our love of hiking began with this peak. In 2008, then-five year old Alex and I hiked this Four-Thousand Footer for the first time. Reaching the summit had a profound impact on my daughter. She immediately decided she wanted to hike more mountains and, fifteen months later, she became the second-youngest girl to have hiked all 48 of New Hampshire's highest mountains. (Her original "NH48" quest is chronicled in my book, Up: A Mother and Daughter's Peakbagging Adventure). In March 2012, then-nine-year-old Alex became the youngest person to have hiked all 48 of these same mountains during calendar winter. Sage's first 4K was also Tecumseh. She first climbed it when she was 4 -- I suspect Alex's enthusiasm was responsible for Sage's motivation. Sage loved her Tecumseh experience and soon began her own NH48 quest. 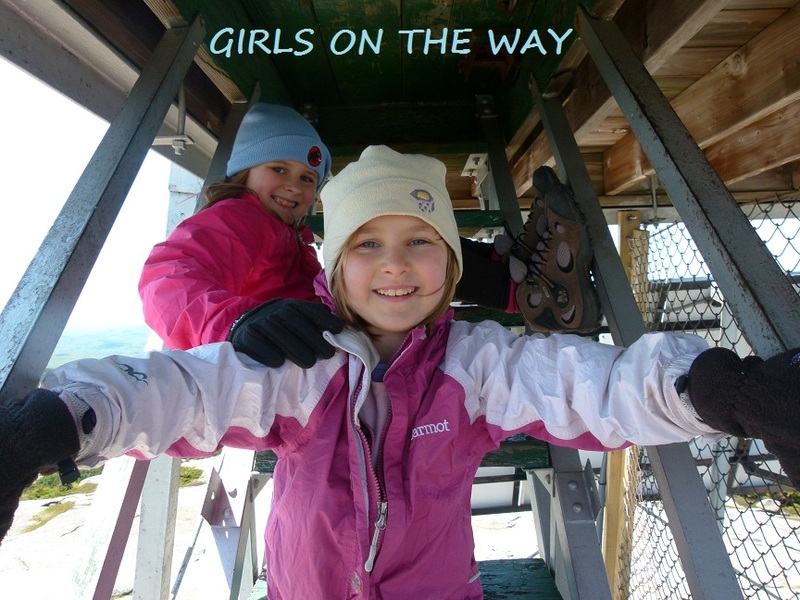 In November 2011, Sage broke her sister's record and became the second-youngest girl to have hiked the all-season NH48. Since Alex's first ascent of Tecumseh back in 2008, both girls have hiked hundreds of mountains, including 42 of the United States highpoints. They've hiked in all kinds of weather and in all four seasons. Now, we ready ourselves for an amazing 500-mile walk across Spain. In other words, Tecumseh completely changed the course of our lives. Our latest Tecumseh hike was accomplished quickly; the girls now usually hike at an average adult pace. We were up and down in three and a half hours. That's another reason we like Tecumseh -- it doesn't take all day to hike, yet it still gives the legs a nice work-out. Glencliff Trail, Moosilauke Carriage Road. 3300 ft. elevation gain, about 7.8 miles roundtrip. Moosilauke is another special peak -- Alex finished her first round of the NH48 on this "gentle giant" in August 2009. Last Saturday's hike was lovely. The weather was unseasonably warm, which meant there was no risk of frostbite and we could take our time on the summit without succumbing to hypothermia. Hugh came with us, as did our friend, Samantha. As you can see, we were blessed with an excellent undercast. Hope everyone has a great week! I'll post again next Monday.